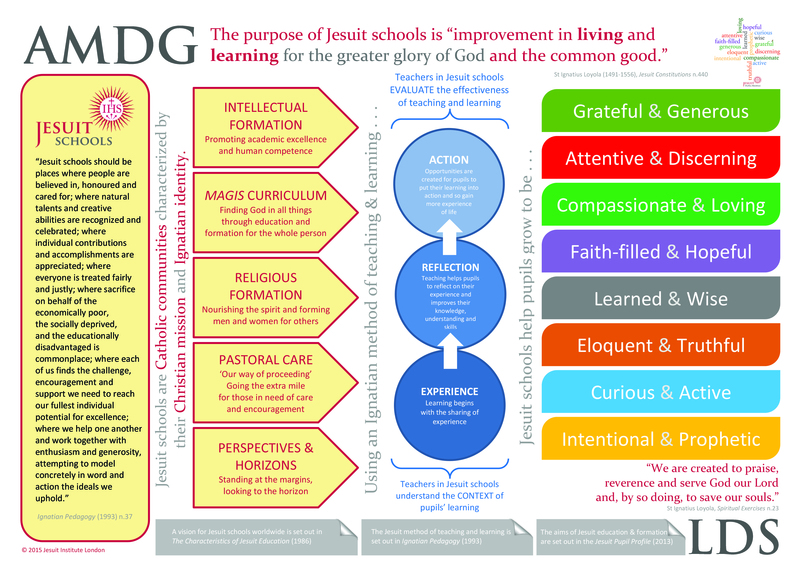 The AMDG to LDS document is an attempt to draw together the various statements about Jesuit education on one sheet of paper. 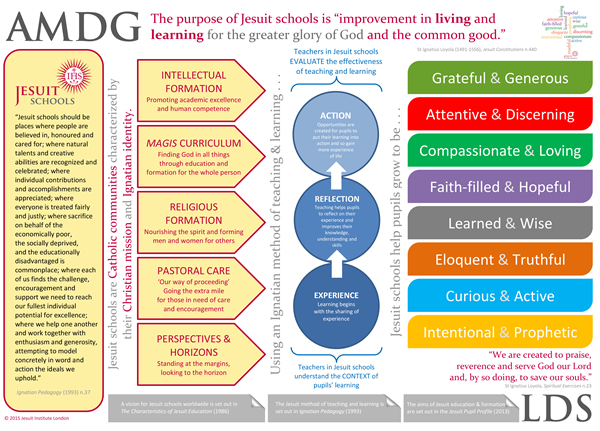 The document displays key ideas from St Ignatius and from The Characteristics of Jesut Education (1986), Ignatian Pedagogy (1993), and the British Province's Jesuit Pupil Profile (2013). Latin: ad majorem dei gloriam = for the greater glory of God. This phrase is used repeatedly by St Ignatius in the Constitutions and his many letters. AMDG has become the unofficial motto of the Society of Jesus and its institutions including the schools. Pupils in Jesuit schools traditionally write AMDG at the top of each piece of work, dedicating it to the greater glory of God. 'Jesuit schools are Catholic communities, characterized by their Christian mission and Ignatian identity.' This statement draws on the three elements (proposed by the 35th General Congregation of the Society of Jesus) for reflecting on the characteristic ethos of Jesuit communities and works: identity, mission and community. This statement tries to articulate the Christian, Catholic and Ignatian character of the schools: Christian in mission, Catholic in community, and Ignatian in identity. Ignatian pedagogy is the distinctively Jesuit method of teaching and learning, dervied from the fundamental methods of the spirituality of St Ignatius. Teaching begins by exploring and articulating pupils' experience, then reflects on those experiences and builds upon them through new teaching and learning, and finally puts new knowledge and skills into action. This model (or Ignatian Pedagogical Paradigm) is completed by the teacher's deep understanding of the context of his/her pupils' background and learning styles, and through careful evaluation of the effectiveness of teaching in terms of the aims of Jesuit education (ie. it is as much about the values and attitudes being adopted by a young person as about the knowledge and skills they acquire). The Jesuit Pupil Profile is an initiative of the British Jesuit schools. It aims to articulate the kinds of character traits and virtues we wish to see grow and flourish in the pupils in our schools. Some of the 16 virtues relate more particularly to the education ("improvement in learning") strand and others to the formation ("improvement in living") strand of Jesuit education. The AMDG to LDS document needs to be printed to A3 size for best effect. The copyright of the AMDG to LDS document is owned by the Jesuit Institute London. It may be freely used in Jesuit schools. If you wish to use it in other contexts or in print, please contact us for permission. Thank you.